The second and final part of riders performed their Individual Tests today to decide the first set of Individual Dressage medals. 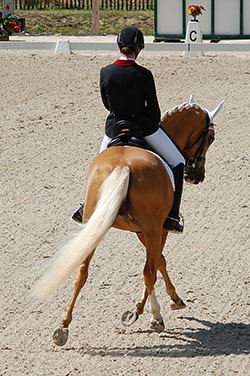 GB's Erin Williams & Dynasty (DRP; Deinhard B x Arts-Dancer-Boy) were the sole British representatives in this session as the random draw had resulted in the 3 other British dressage riders competing in the first half of the class. Erin & Dynasty were drawn towards the end of the class and again, they produced an impressive test that received marks ranging from 70.122% to 73.293% giving them an average of 71.781% and 10th place in the class. The other British riders in the class of 52 competitors placed 14th (Phoebe Peters & SL Lucci), 19th (Maisie Scruton & Rembrandt DDH) and 23rd (Hariette Williams & Madam's Miss Maria). The top 15 combinations in the Individual competition compete in Sunday's Kur (Freestyle to Music), but each country may only put forward their best 3 combinations. Erin & Dynasty and Phoebe & Lucci go through for GB. A more detailed report will follow as soon as possible, but in summary, the British riders had mixed fortunes. Sadly the individual rider, Annie Keir was eliminated for a fall from Hotshots (breeding not recorded) at fence 13 part B. Annie wasn't hurt in the fall and she later commented that her air jacket had now been christened!! 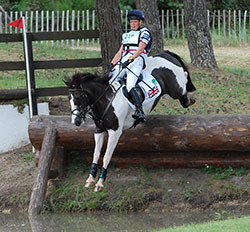 The other British individual, Yasmin Ingham & Craig Mor Tom (breeding not recorded) had refusals at Fences 3B and 18A (the drop in to the second water) and she was also well over the time allowed. For the team, the first rider, Louisia Nesbitt with Carrowmore Gemstone (breeding not recorded), got the team off to the best possible start with a clear round that was exactly on the time allowed. The second team rider, Charlotte Bacon & Three Wells Breeze (breeding not recorded) were also clear, but were a little slow so added 10 penalties to their dressage score. Madeleine Taylor & Bandalera (Welsh PB; Ski Dancer x Corston Comet) needed to go clear for GB to have any chance of overtaking the Dressage leaders, Ireland. 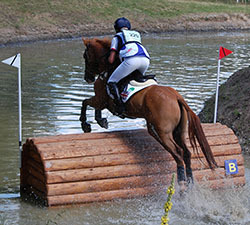 Sadly, after jumping really well around most of the course, they had a refusal at fence 18B, a skinny in the second water on a turn after a drop fence into the water. 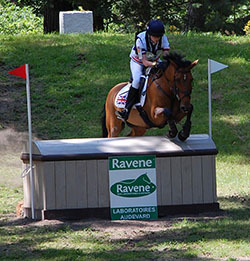 Having to re-route to the alternative part B fence meant that Maddie also incurred 11.2 time penalties. 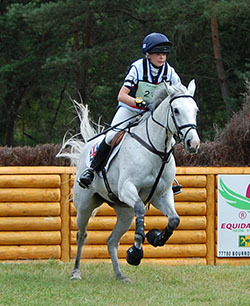 The pressure was then on the last rider and pony, 2012 British Eventing Pony Champions, Janou Bleekman & Cregaan Scenic (breeding not recorded) and they flew round the course to finish clear within the time. There was a Consolation Jumping competition for those riders that had not got through to the Individual final. 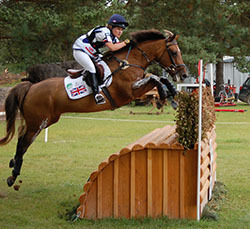 The winner was Philip Carey (SWE), who had fallen off at the second fence in the second round of the team competition. This time, he achieved a clear in the first round and then the fastest clear in the jump off. Second was Tom Foley (IRL) and third was Marie Scharapan (SUI). All of the top six riders jumped double clears so were separated on their jump off times. As all the British riders are through to the Individual Final there was no Team GB representatives in this class.